One of the UK's biggest pieces of public art is to be taken down after being blighted by safety concerns and a legal row. 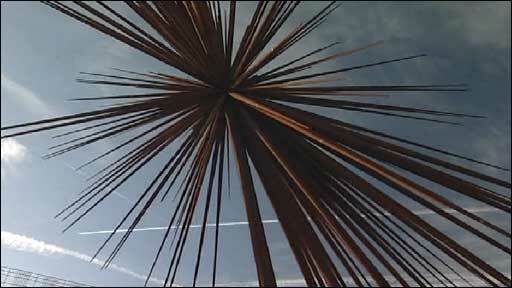 The £1.4m B of the Bang, outside the City of Manchester Stadium, has had problems since it was erected in 2005. One of its 180 steel spikes was dislodged within two weeks, and 22 have now been removed from the sculpture. Manchester City Council has decided to put it into storage, but bosses said it could be rebuilt in the future. The council said the sculpture could be revived if technical problems could be resolved and the necessary funding - estimated between £2m and £3m - could be found. One of the options being considered is to remove the steel spikes and replace them with similar ones made from a lighter material. However, the council stressed that no more public money would be spent on the project. It said if the artwork was rebuilt, it would either stand at its current location or elsewhere on the site as part of the redevelopment. Sir Richard Leese, leader of Manchester City Council, said: "Thomas Heatherwick's B of the Bang is a magnificent artistic statement that was just right for modern Manchester. "It is regrettable that technical problems have undermined that artistic vision." He added: "After taking into account expert views, the only practical alternative is to take the sculpture down. "We have committed ourselves to continue to work with the artist to determine whether there is a robust and affordable strategy for the re-construction of the structure on the site. "We have, however, made it clear that there will be no city council funding made available to support its rebuilding even if the further work shows this to be a feasible option." Manchester Liberal Democrat Leader Simon Ashley argued that instead of rebuilding it, the council should just a draw a line under the controversial sculpture. "Frankly, this sculpture has been an expensive embarrassment, and has become a symbol of decline. "The good news is that it is coming down, the bad that Labour want it to go up again." Angel of the North creator Antony Gormley has previously written to council bosses urging them not to scrap the artwork, which was commissioned by the council to mark Manchester's Commonwealth Games in 2002. Standing 56m (183ft) high, its name came from sprinter Linford Christie's comment when starting a race he always went on the "B of the bang".